Pollen is a fine to coarse powder consisting of microgametophytes (pollen grains, male). In plants, a gametophyte is the multicellular haploid structure containing a single set of chromosomes. In other words, pollens are small, egg-shaped male cells found in flowering plants. The female gametophyte (ovule) is called a megagametophyte and the male gametophyte (pollen) is called a microgametophyte. The transfer of pollen grains to the female reproductive structure is called pollination. Pollen is an airborne outdoor allergen. This sequence is remembered by the mnemonic TGR MI DC/DC ("a Tiger with an MI went to DC"). Characteristics of allergic sensitization among asthmatic adults older than 55 years: results from the National Health Allergy Season Year Round. WTOC-TV Savannah. Interactive Allergy Map by Greer Labs. Click your state to find region-specific, common airborne allergens there. There are approximately 30 to 40 species of elm. Three species of elm pollinate in the fall. The tree's common English name goes back to the Old English æsc, a word also routinely used in Old English documents to refer to spears made of ash wood. The wood is hard (a hardwood), tough and very strong but elastic, extensively used for making bows, tool handles, and baseball bats. These are generally small to medium-size trees, mostly of northern temperate climates. The bark of all birches is characteristically marked with long horizontal lenticels, and often separates into thin papery plates. The common name birch is derived from an old Germanic root, birka, with the Proto-Indo-European root *bherəg, "white, bright; to shine." In Belarus, Russia, the Baltic States, Finland, Sweden and parts of northern China, birch sap is consumed as a refreshing beer. The birch is considered a national tree of Russia and is also New Hampshire's state tree. Cross-reactivity in Pollen-Food Allergy Syndrome (PFAS) or Oral Allergy Syndrome (OAS) (click to enlarge the image). Pine pollen looks like a Mickey Mouse cap. The large size of the pollen (50-100 micrometers) means that it is rarely implicated in allergic rhinitis. Grass pollens look similar regardless of species. They are monoporate (one pore), relatively large (20-45 micrometers) and round. The pollen is slightly granular in appearance. The pore is surrounded by a thickened ring (annulus) and may have a cap (operculum). Southern grasses include Bermuda, lovegrass, prairie grasses (eg, salt, buffalo, and grama), Bahia, Johnson, corn, and sugarcane. Northern grasses include Timothy, orchard, rye, fescue, bluegrass, redtop, sweet vernal, brome, velvet, and canary. Bermuda grass (Cynodon, Greek "Dog-tooth") is a genus of nine species of grasses, native to warm temperate to tropical regions of the Old World. The genus as a whole is known as Bermuda Grass or Dog's Tooth Grass. It is difficult to pull out because the rhizomes and stolons break readily, and then re-grow. It is also noted for its common use on the surface of greens on golf courses, as well as football and baseball playing fields. Timothy-grass (Phleum pratense), is an abundant perennial grass native to most of Europe except for the Mediterranean region. It grows to 50–150 cm tall/ The flowerhead is 7–15 cm long, with densely packed spikelets. Timothy-grass can be confused with Meadow Foxtail. Timothy-grass was unintentionally introduced to North America by early settlers, and was first described in 1711 by John Herd from plants growing in New Hampshire. Herd named the grass "herd grass" but a farmer named Timothy Hanson began to promote cultivation of it as a hay about 1720, and the grass has been known by its present name since then. It is commonly grown for cattle feed and, in particular, as hay for horses. It is considered part of the standard mix for grass hay and provides quality nutrition for horses. Timothy Hay is a staple food for domestic pet rabbits, guinea pigs, chinchillas, and degus, often making up the bulk of their diet. It has been used as SLIT under the name Grazax. Weeds are invasive plants that are neither trees nor grasses. Pollen grains are 25 micrometers, spherical and periporate (like a golf ball). Ragweeds (Ambrosia), also called bitterweeds and bloodweeds, are a genus of flowering plants from the sunflower family. The scientific name of this genus is sometimes claimed to be derived from the Ancient Greek term for the perfumed nourishment of the gods, ambrosia which would be ironic since the genus is best known for one fact: its pollen is a common allergen. Ambrosia produces separate male and female flower heads on the same plant. After wind pollination, the female flowers develops into a prickly, ovoid burr with 9-18 straight spines. This burr gets dispersed by clinging to the fur or feathers of animals passing by. Each plant is able to produce millions of grains of pollen over a season, and the plant is wind-pollinated. It is highly allergenic, and generally considered the greatest allergen of all pollens, and one of the primary causes of allergic rhinitis in North America. Ragweed plants are prolific pollen producers, accounting for 75-90% of all pollen captured between August and October in some regions. Ragweed season ends when frost prevents the plants from flowering. Ragweed is a plant of concern in global warming because higher levels of carbon dioxide may increase pollen production. On dry windy days, the pollen may travel many miles. No area in the United States is ragweed pollen free. Ragweed was accidentally introduced to Europe during World War I; they thrived and have greatly spread since the 1950s. Total eradication of ragweed is considered impossible, owing to the plant's tenacity and tremendous seed-producing capability. Salsola (also known as Tumbleweed, Saltwort or Russian thistle) is a genus of herbs, subshrubs, shrubs and small trees. "Tumbleweed" plants break away from their roots in the autumn, and are driven by the wind as a light, rolling mass, scattering seed far and wide. The seeds are produced in large numbers. The deep, ineradicable taproot survives to grow again the following season. The leaves and shoots of many species are edible and some are grown as vegetables, often used for salads. In film and television shows, a tumbleweed blowing across a scene can be used to indicate a deserted location or to emphasize an awkward silence. The goldenrod is a yellow flowering plant in the Family Asteraceae. Probably due to their bright, golden yellow flower heads blooming in late summer, the goldenrod is often blamed for causing hay fever in humans. The pollen causing these allergy problems is mainly produced by Ragweed (Ambrosia sp. ), blooming at the same time as the goldenrod, but is wind-pollinated. Goldenrod pollen is too heavy and sticky to be blown far from the flowers, and is thus mainly pollinated by insects. The goldenrod is the state flower of the U.S. states of Kentucky and Nebraska. Clinical review: ABC of allergies, Summer hay fever. BMJ 1998;316:843, figure. Pollen Calendar for North America. Pollen, from Wikipedia, the free encyclopedia. Tips to Remember: Outdoor allergens. AAAAI. Modified text and links about different pollinating plants are from Wikipedia, public domain. Pollen-producing plants (weeds and trees) in Omaha, Nebraska. V. Dimov, M.D. TIME Photos: Fruit: Edible, Inedible, Incredible. TIME, 10/2008. Pollen & Spore Counting, Part I: Air Samplers. 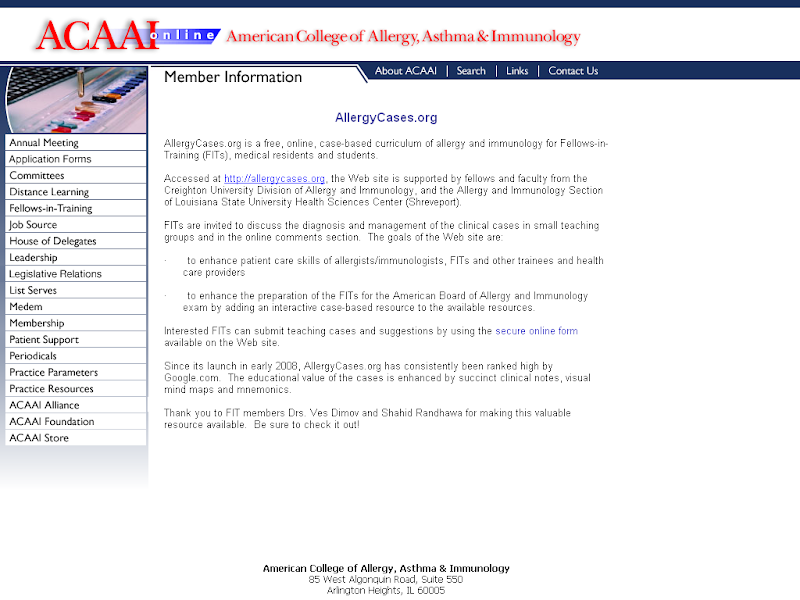 Conferences Online For Allergy, Children's Mercy Hospitals & Clinics. Pollen & Spore Counting, Part II: Pollen. Conferences Online For Allergy, Children's Mercy Hospitals & Clinics. CNN Commentary: Terrifying tumbleweeds. CNN, 04/2009. Pictured: The irritating grains of pollen that look like beautiful works of art under the microscope. Daily Mail, 2012. Thanks for putting the pics up Ves. This really helps.